These home pages remain free of any charge. We need donations or subscriptions/gifts for students, military and family. Please pass on this website link to your family, relatives, friends and clients. The most in-depth, comprehensive site about the Skagit. We rarely have the opportunity to read more than one perspective of a historical event from the 1880s and '90s on the Skagit frontier because most of the newspapers have burned or disappeared. In this case we were lucky to find a combination of diaries, letters and newspaper columns written after the fact. Fairie Cook turned 22 in the winter of 1887. 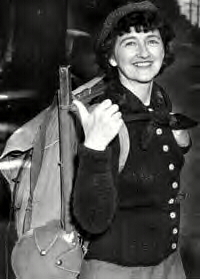 She was the daughter of Mortimer Cook, founder of Sedro, and she shared his sense of adventure. Her younger sister, Nina, wrote in her diary about Fairie's pre-emption claim, a rare quest for a young woman in the Skagit wilderness. Years later, Nina wrote to her childhood Dwight Brosseau, with more details of the trek. And he, in turn, shared Nina's story with June Burn, a columnist for the Bellingham Herald, who had homesteaded the last available island in the San Juan archipelago in the 1920s. Then Burn interviewed Judge Fred Abbey for her three columns in 1931 to complete this wonderful story of pluck and bravery. We start with Nina's diary notation about Fairie and their mother, Nan, returning home after their harrowing experience in a blizzard. Blue underlined links provide more background information about the people and events. They got home yesterday. I did not think of expecting them until Wednesday. I am happy now. They had a very hard trip. The snow was two feet deep at the cabin. The "telegraph trail" crossed and re-crossed their own respective trail so much that theirs was wholly swallowed up. One of the afternoons (I don't know what day) about three o'clock they got wholly discouraged and made up their minds about to have to stay out all the night. Fairie then thought she must run up the telegraph trail a ways and see if there was any outlet there is some way. She went up the trail about a half mile and was calling back to Mama and Fred Hall when a man named Mr. Abby [actually Fred Abbey, see below], who has a claim around there, heard them and answered. They called that they wished to see him and he came and took them to a cabin. Fairie said he said when he saw them that he did not have much of a house but he had plenty to eat and plenty of blankets and wood and Fairie said nothing ever sounded so good to her and she never was so glad to see any man before. There were two other men at the same cabin — Mr. Paddy [might be Peddy, see story below] and Mr. Lewis, and Mr. Abbey said he must run on a little and tell them that two ladies were coming, for the shock would probably kill them, of taken too suddenly. He said afterwards that if he had thrown a bombshell into the cabin they could not have been more surprised to hear that two ladies were coming. An unheard of fact, one said. They were all so astonished to think of their undertaking such a thing. Mama and Fairie say they were all so kind and let them have about half their clothes to put on for they were "wringing wet" literally. Mr. Abbey sat up all night to keep the fire up and they all went on with them the next day to ''Camp 86.". Friday Feb. 26 Fairie started this morning at 8:30 to LaConner to prove up on her pre-emption claim. She got Mr. Benson's horse [illegible] at Sterling. Mr. Lohr and Fred Hall are her witnesses. Poor Fairie! She has been very sick indeed since she came home from the claim. She fainted twice and has been feeling very badly. It is just awful for her to have to go down there now for she is feeling very weak and bad yet. Her countenance has really changed. It was in 1886 that the Pacific Telegraph Company began to extend its line from Vancouver to Mount Vernon. It was in '84 that two young men from the East had taken up their claims on the prairie where Alger now stands. The land was then a jungle for the most part un-blazed, unsettled save along the river at tidewater. But in two years the young men had come to be familiar with every foot of the woods and prairies and marshes. Thus, when the telegraph line surveyors came through, it was natural that Fred Abbey — now Judge Abbey, of Anacortes — and Jim Peddy should get jobs helping the engineers to blaze out the way. The way which the telegraph would follow led by Samish lake. The workmen pitched their tents in Charlie Barnes's clearing. From there it went to Bow — a long crooked trail but easy. They then established the clearing which later became Blanchard. Jimmie Samson became the lineman with ten or twelve miles of line to patrol. These new trails which young Fred Abbey helped to blaze in 1886 obliterated the old trails along the lines of homesteads, between settlements. And thereby hangs a tale. Do you remember Mortimer Cook — the courageous, picturesque, good, cantankerous, adventurous old fellow who named Sedro-Woolley, who made and lost a fortune there, and who at last died in the Philippines? Well, he had two daughters. One of them lives now and writes occasionally to Mr. Brosseau, who once worked for her father in his store at Sedro-Woolley. The other one, Fairy, may or may not be living — I don't know. But that she resembled her father in courage and love of adventure is proved by a story which Mr. Abbey tells of her. When she was 21, she took up a claim as was her right. All tidewater and river bottom claims were taken long since, I suppose. Anyhow she chose one up in the hills, which sounds like what her father might have chosen in his young days. A deputy surveyor of Skagit county was "sweet" on her. He helped her to locate her claim and built a shake shack for her up there. One day Fairie and a girl friend set out to go to Fairie's claim alone. Fairie had learned the way of her surveyor friend. They found the blazes again and tied bits of rag and string along occasionally to make sure they would find it again on the return, for the telegraph blazes had confused the way until there were so many trail blazes it was easy to lose the way. On the return, the girls did get off between sections 7 and 12, where the blazes were especially numerous. They got onto a footlog across Samish river and dared go no further for the forest lay about, terrifying to them. And so there they stayed the night through, the Swedish girl with her head in Fairie's lap, the brave daughter of Mortimer Cook singing and beating on a tin cup all night with her button hook to keep the bears away! Next day the trail difficulties resolved themselves and the girls got home. But I feel pretty sure that Fairie didn't tell her mother what had happened for it wasn't long afterwards that the girl and her mother essayed the same trip together to fall into the same disaster, only more so! June Burn, Chapter Two, Jan. 14, 1932 When Fairie Cook and her mother went to the girl's claim up in the hills, the telegraph trail had completely obliterated Fairie's old blazes which used to show her the way. It was in the winter, too, and the ox and horse-drawn sleds and wagons had turned what paths there were into a hundred crossing paths. It had snowed all day. Three inches of snow lay on the land. In mid-afternoon the wind had begun to come from the North and the weather had cleared. Cary Lewis, Jim Peddy and Fred Abbey had been doing something or other inside all day when a tool was need which Abbey volunteered to go to his cabin to get. The way took him to the other side of the marsh but there was barely time to get there and back by dark so that the young man didn't mind. He took along his dog. Nan Pollock Cook, 1879. She was one tough lady. In 1864, she spent part of her honeymoon with Mort riding on the back of a mule to his town in British Columbia, Cook's Ferry. All these Cook photos were taken in Santa Barbara. The snow was freezing. Fred got to his cabin, went in after the tool. The dog began woofing, gazing at the same time across the impassable marsh. Abbey went to the door. Hear somebody across that valley calling. The dog replied with his barks. Abbey hallooed: "What do you want? What do you want?" "I don't know what you sa-a-y!" came faintly across the marsh and then "We are lost!" He thought it was the voice of a boy. Never dreamed it was a woman. "Where are you going?" he shouted across that half mile of marsh. But the other couldn't understand him. "Come! We're lost!" the voice called back with decision. "It made me sore," Judge Abbey said, "but I went. I knew it would take me till dark but I thrashed through the morass close around the edge of the marsh and got to the footlog. There I saw the snow tramped down hard. I called out. A voice up the trail answered. I went on. The dog started back and growled. A figure came down the trail. And then I saw it was a woman — a little short woman. It was Fairie Cook. She had on rubber boots and bloomers and blouse made of overall cloth and a man's hat. Her hair was a mass of curls tied at the back of her neck. She was soaked. "'For God's sake!" I cried, 'What are you doing here'?" Fairie confessed that with more courage than sense she was on her way to her claim; that her mother was with her and that she couldn't find the way any more. I felt like swearing, but we went on up to where the mother was down on her knees beside a log. She was praying and thanking God for her rescue. We stood there till she was finished and then she got up and threw her arms around my neck and said I was an angel sent from God. "No such thing," I said, but she held to her belief that God had sent me. . . . I took them on up to the cabin where we three men had been working but I didn't dare embarrass the boys without warning so I told them to wait on the trail until I gave them the signal to come on. I went on ahead and told the boys that two women were coming to see us. "Women!" they shouted. "Who on earth. . .?" And then we all fell to putting things to rights. We had a brush tied to a stick for a broom. One went to using it, another cleared the table — you never saw dust fly so. Then the women came in. The mother was dressed like the girl. They had been carrying some bread with them. It had melted and become dough and had run down their backs. the snow was packed so hard into their boots it took us twenty minutes to get them off. We gave them all the dry clothes we had and took to the brush while they changed. When we came back everybody laughed. The mother was hysterical with laughing. Cary fixed them up a supper that couldn't be beat no matter where you went. He was a good cook and we had plenty of grub. That night Jim and Cary took the double bunk and the mother the other one. Fairie and I sat in front of the fire and talked all night. But the old mother slept, I tell you! Next day was frosty and clear and all five of us started out to hunt Fairie's claim. Cary had made up some food for them. During the night Fairie had given me an idea of where the land lay so that I knew where to look. It was in section 11. We never did find the trail but we found the claim and tramped out a trail. The snow was a foot deep up there, but there was plenty of dry wood in the cabin so we left them with a good fire and enough grub. They were to stay two nights and we were going to get them and take them home, but when we went up they were already gone. We followed their trail until we saw that they had got onto the right way. . . . I never saw Fairie again. "Well, you'd better come down to see my dump." We went to the store and fine old man opened the store and said he guessed the first thing to do was to open the safe. He went to a corner where he kept a stack of old-fashioned chambers. They were stacked high. "If a robber came in he wouldn't steal but one of these, would he?" he asked me. I agreed that one ought to be enough. "If he had a family two ought to do him, oughtn't it?" I agreed again. "Well, that's why I keep my money in the third one!" whereupon he lifted two of the jars down and from the third took out his cash. "Don't need any safe," he said. This is safe enough." "Mortimer Cook was a grand old man," said the judge. Fred Abbey's personal history by June Burn Judge Fred G. Abbey came to Puget Sound in 1884 from Massachusetts. He went back in '89 and brought out his bride. They lived 'til 1905 on that first claim where Alger now stands, then moved to Anacortes, built a beautiful white house onto whose porch one steps straight off the earth on the level, and live there yet. It is one of the prettiest houses in Anacortes or Skagit county, partly because of it s gracious simplicity but chiefly because of not being raised up off he ground on stilts. If there must be a basement for a furnace, let it be dug out, but do not set a house up off the ground no matter how sensible it may seem. This house is the only one I have seen in Puget Sound which sits close to the earth like that. It has stood for a quarter of a century and looks as if it would stand for another quarter and that is about as long a s wooden house will last or is wanted, anyhow. Around the house lies a fragrant, blooming garden. From its windows and its back porch Mount Baker rises on mighty shoulders, dominating the landscape. Mrs. Abbey says that many a time she has been so tired washing that she could go no further and has looked up from her work to that mountain so serene and white and has somehow gone on, herself refreshed and recreated. Alger: at that time, the little village was actually called Lookout. 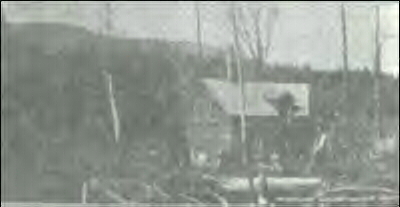 Sometime by 1914 the town was named after the Alger Logging Co., owned by Russell Alger and Revaux K. Hawley, who logged the area until 1901. Read our 4-part series on Alger (Lookout) and its pioneers. Brosseau: the daughter she mentions here is Nina, the youngest Cook daughter, who was then living in Rockford, Illinois. Mr. Brosseau was Dwight Brosseau, whose pioneer parents, George and Edna, lived between Sterling and Sedro. His mother's lasting legacy was that she sewed the flag that waved from the top of a 200-foot fir on July 4, 1890, in Sedro as the two villages held dueling celebrations. Fairie's death: Fairie Cook Litchfield died on Aug. 15, 1926, at her sister's home in Rockford. She was a widow. Deputy Surveyor: that was Fred Hall, mentioned in Nina's diary above. He and his brother Woodbury homesteaded in the Prairie district, relatives of the Kallochs, for whom the road is named. The editor saw several affectionate letters in the family collection from Fred Hall to Fairie while she attended Wellesley College. She wound up marrying the father of her college roommate. 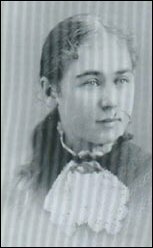 Girl friend: the girl was Louisa Anderson, a Swedish immigrant whose brother worked at Cook's shingle mill. 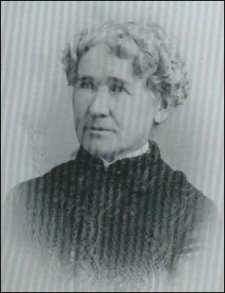 She later married Joseph Hart, one of the four British bachelors who settled future Sedro. Sections 7 and 12: the sections she refers to are in Township 36 North, Range 4 East. The town of Alger was in section 7, with the west fork of the Samish flowing nearby; the east fork flows through the east part of the township from section 12 down through Warner's Prairie. We suspect that Fairie found the claim with the help of Charles Warner, who logged Cook's timberlands. Section 11: that section is about four miles east of the town of Alger and a half mile of what was then called Dry Creek. On the 1925 Metsker's map, that whole section is owned by David Tozer. We hope that a reader can identify who David Tozer was. His wife is listed as Julia Tozer and they owned large pieces of land all over the county. It may have been a relative of A.A. Tozer, the druggist partner of A.E. 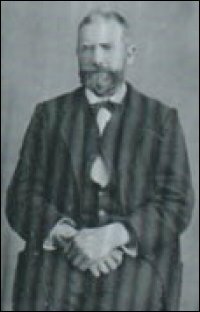 Holland in Sedro in the 1880s. Please email us if you know. Years later: that would have been sometime after Fairie married Cyrenus Wirt Litchfield in Oak Park, Illinois, in December 1896, and sometime before Mortimer died on Nov. 22, 1899, in the Philippines. Safe: there is a note of irony here. After he made a small fortune in Kansas, building the first iron bridge over the Kaw river, and after his second daughter died in a fire in Topeka, Cook moved his family to Santa Barbara in 1871. Los Angeles was barely a village and Santa Barbara was a market center on the California coast, but really just a smattering of buildings. Cook brought a safe to town and started a bank there, which became the first gold bank south of San Francisco, and his safe might have been the first one set up in southern California. The diary of Nina Cook, daughter of the founder of Sedro, written while she was a teenager in Sedro in the 1880s. How Fairie Cook, daughter of the founder of Sedro, staked a timber claim of her own near future Alger in the 1880s. Ray Jordan's memories of growing up as a child on Mortimer Cook's ranch on what is now Cook road west of Sedro-Woolley. Several more Cook stories are planned for 2005, including Mortimer's complete biography. Did you enjoy this story? Please consider subscribing to the optional Subscribers Edition. That is how we fund this grand project. Please report any broken links or files that do not open and we will send you the correct link. Thank you. Heirloom Gardens Natural Foods at 805B Metcalf street, the original home of Oliver Hammer. Oliver Hammer Clothes Shop at 817 Metcalf street in downtown Sedro-Woolley, 82 years. Bus Jungquist Furniture at 829 Metcalf street in downtown Sedro-Woolley, 36 years. Schooner Tavern/Cocktails at 621 Metcalf street in downtown Sedro-Woolley, across from Hammer Square. Park your RV or pitch a tent by the Skagit river, just a short driver from Winthrop or Sedro-Woolley. Would you like to buy a country church, pews, belfry, bell, pastor's quarters and all? Email us for details. Did you find what you were looking for? If not, please email us and tell us what you seek and we will put it on our list to research. The more details, the better. Remember, we welcome correction and criticism. Please click on the email slot at the right to report any problems with these pages or to suggest ideas for future stories. This is a completely free site. We fund it by providing an online magazine for paid subscribers. If you are not already a subscriber and you would like to help support our considerable research costs, you can subscribe for just $20.00 per year. As a paid subscriber, you will receive eight yearly issues plus many rare treats between times, including scans of photos and documents that illustrate local history, before they are shared with anyone else. You can go here for Subscription details and you can read the preview edition to see examples of our in-depth research. You may also order gift subscriptions for friends, family or clients who are interested in local history or students or military people who are away from home. Or you can email us for more details. Do you have scanned photos to share? Or you can mail us copies. See addresses to right.